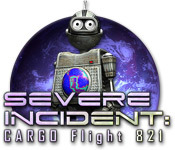 Severe Incident: Cargo Flight 821 is rated 3.1 out of 5 by 69. Rated 5 out of 5 by LeftBehind from Great Game When I first began the game I too felt lost as to, what to do, and where to go, I nearly backed out, but am so glad I didn't. This game, being different began to draw me in while trying to figure out how it works. I found the info. and hints are there, I just had to pay closer attention to everything. For me, I kept a close eye on the curser for any changes, clicked on everything, and checked on the data often. Eventually, just before the demo ended I had that ah ha! moment... I don't usually get into Sci-Fi much, but the graphics, voice overs and sounds are so good it held my interest, now I'm going to have to buy it. I'm totally sold on this game, just give it a little time, if you like a bit of challenge I think you'll have fun with it too. Rated 5 out of 5 by 70summerfield from Excellent Game Though not a particular sci-fi fan, I've really found this to be an enjoyable. It's a welcomed departure from ghosts, lost loves and interminable HO scenes. The HO scenes in this game are nicely spaced and reward you with items neccesary for advancement. I like the artwork and the music is not an irritant. This game actually makes you think and use your reasoning powers, and that's refreshing. There are times when I just want to zone out and play something minimally challenging, but its nice to have a challenge every now and then. If you liked Tiny Bang, Green Moon, and games of that ilk, I think you will enjoy this game. It's a buy for me. Rated 5 out of 5 by Mary_Game_Nut from Challenging and fun I like that the hints are there if you want them, but you can use them or not as you wish. Rated 5 out of 5 by Gamer_7 from Reviews are all over the place. Do give this game a try. This game doesn't exactly hold your hand. But there are hints and clues. Once you assemble the robot, you can click on "DATA" and you'll have tasks, a map and "data" available. The map shows where hidden object scenes are, as well as where you are but you can't use it to jump to another scene. No click penalties in the HOS. The hint button doesn't work outside of the HOS. Some of the hints are provided through what I'll call cut-away shots. They show you when something has changed in another area after you've completed a task. So, of course, you know you need to go there next. I think the game deserves a better rating than what it is being given, but as another reviewer said, "You'll either love it or hate it." For this game, I suggest actually leaving the tutorial on until it finishes. There are just enough things about this game that are different, that I think the tutorial makes game play better. Please try this game. Rated 5 out of 5 by Nilosh from I Love This Game! A Sci Fi HOPA game for adventurers and hard-core players who like a bit of challenge. This is one of those games that you will either love or hate. After the first 10 minutes, I loved it and went off to buy. Sci-Fi is a theme we dont get every day and I just could not resist cute little Oscar. Your first task is to assemble him by locatying his parts. Fron then on, Oscar the Robot is your companion, guide, hint and data holder. His voice is a bit irritating, but then again, he is a robot. The story is that your ship has crashed on a mysterious planet and both you and Oscar must find a way to escape. I Almost gave this game a 5 star game but unfortunately the graphics were just not up to standard. Although I really loved the artwork, the bright colors, graphics were a grainy and a bit blurry. SOund effects were amazing , if not a bit too loud but then again, we are in a spaceship and on a planet where things are not what they seem. There are no game modes available and you do have sparkles showing you points of interest. The HO scenes are junk-piled and non-interactive. You quest is to find parts, assemble them and search the planet with Oscar, who also provides you with a map and task list. There are mini-games to play and they were relatively easy to solve. Actually, the gameplay was easy and the challeng really is to find your way around. I expect a walk-through will be useful. Like I said, you will either love this or hate it. I recommend you try the demo to find out. I myself am off to join Oscar and continue onwards and awayyyyyy. Rated 4 out of 5 by graceland9 from Great Adventure Game! Yes, Severe Incident is clunky and doesn't offer all the bells and whistles of other games. However, I really enjoyed playing it, thanks to several factors: I really enjoyed being outside in a HO game. So often we're imprisoned in a dark mansion with only a few scenes set in the outdoors. The landscape constantly expands, so you really have to remember where you are (especially without an interactive map.) I chose to view this as a challenge! The sci-fi atmosphere. There's a robot as well as dinosaurs an abandoned trains, quicksand... the designers have created a great atmosphere. If you enjoyed Myst, which I did, you might find this reminiscent of that game - plus HO's. The graphics are clunky, and there are some outright mistakes (It's pulley, not 'pully'!) However, I was having so much fun negotiating the cool landscape, I let it go. If you want an adventure HO with sci-fi elements for a few hours of gameplay, you could do a lot worse than SI. Rated 4 out of 5 by katbear50 from Intrigue + Challenge + Difference = Gr8 Game! Along with a Quirky Robot Sidekick, you take off thru a Colorfully Challenging Outer Space for an exciting ride. What a pleasant change from all the Horror as of late. Take "Cargo Flight 821" for a Test Run, for yourself, I think you will like it. Be sure to put your thinking caps on, take your time and Enjoy! Rated 4 out of 5 by planetankh from Deserves a Higher Rating! Much better game than current 3 stars rating. Has challenge without frustration. Interesting, different story line with some humor (no gloom or fairyland). If you like lots of hints & guidance might not like this game as it has minimal. For me, that was part of the challenge. My criticisms: graphics could be better: great colors but graphics a little fuzzy. Also found cursor very location sensitive in regards to tasks. Cursor indicator signals small and at first were hard for me to tell what they were. But overall a fun, enjoyable game. Rated 4 out of 5 by Lao_Zi from I like this HOAG I do NOT agree with all the bad reviews this game has gotten and I absolutely agree with all those reviewers who were willing to look further than their initial impressions. I like this adventure game, although the dev's could have made some improvements such as: - making the map teleportable - turning the hint button into a real functional aid. Notwithstanding this, the game isn't all that difficult to play. Just look around, try things out, think about possible actions and you will get along just fine. If you are stuck, just take a look at the map: maybe a HOS is active somewhere else in the game, which may give you just that item you need to go on. I regret that the HOS repeat themselves. I always find this to be a lack of creativeness or a proof of laziness from the dev's. Again, if you are stuck, take a look at the task list and you may get an idea of what to do next. All in all, I would say, don't just give it a try, but enjoy the game. The graphics may surprise, but why not? And concerning the music, just turn it down, because you will not stand it longtime. You can still listen to the sounds and the voiceovers of your robot. Rated 4 out of 5 by Mildredh from Wake Your Bored Self Up! This one is another departure from the usual. It takes a bit of doing to get used to the game play but once you do it is a lot of fun. One reviewer had a tip about the robot's arm - it turned out to be very helpful. I liked the graphics, too, kind of cool and definitely alien-like. Rated 4 out of 5 by cdminot from Oscar Rocks! I really liked this game. However, I got stuck at the end looking for one item. Graphics are great, love the bright colors! There was only 1 HOS that I found to be slightly blurry - the rest were good, and challenging because of all the foliage! I really loved having Oscar along, didn't seem so lonely stranded on a planet by myself. Also, I didn't realize until toward the end of the game, that if you click the word "data", you have a map, a task list, and analyzed data to help you move forward; but I don't think I would have enjoyed this game half so well had I known! You are to try to escape the planet, and must deal with creatures, floods, etc. Usually, when collecting items, you know what to do with them, and of course, if you get stuck, look to the data! The hint button only works in the HOS, which I thought was not good, I like clicking the hint button to figure out where to go next (I guess I am one of few people who like having my hand held! lol) For the money, this game is pretty good - much better than some of the ones we have been slammed with lately. Not as good as Cyan, but good enough for when you're bored, or have nothing better to play. All in all, I do recommend this game. Rated 4 out of 5 by unicornone from refreshingly different Not the best quality game but the fact it is so different makes up for that. Visual quality is limited (try before you buy) but sound quality is absolutely fine. Colour is a bit garish but you get used to it. There could be more depth to the graphics with a bit of work but I enjoyed playing it, you need to make your own mind up. At least wait until you are outside before deciding as it gets better as you go along. A lot of forward and back to pick things up, suggesting that more areas could have been developed but I still liked the concept. Made a change from the usual doom and gloom mad scientist, find the treasure and ghosts. Perhaps could have made more use of the robot help if the game makers had been more imaginative. The game cried out for an R2D2 in the game. With more development this could have been a fantastic game but it sure made for a change for me. More sci-fi please. Rated 4 out of 5 by trealm from Different Positives: Story-line is fine Different with a mechanical and space theme You feel like you are in a 3d world I wanted to give this game a 3.5 stars.. because of the following. Negatives: Map - could not jump to different places. This game made you run back and forth a little bit to much. HOS - were Ok, but they make you play the same scene a few times. All and all, I enjoyed the game and glad i bought it. Rated 4 out of 5 by sunfish1 from Severe Incident: Cargo Flight 821 I bought this game. It was challenging for those that are accustomed to playing HOG's, doesn't hold your hand all the way through, will make you use your brain. The robot, gives you direction throughout. Thanks to the programmers for an upgrade to the usual. Rated 4 out of 5 by IdahoForever from Fun, Difficult, Sci Fi Puzzle Game This is a difficult, intuitive, task-oriented game that makes you think, and for me that's a plus. While you are in Cryo-Sleep, your spaceship crashes on a planet you've never been to before. You have to find a way to get off that planet, and back into space. Your hint "button" is a little robot who speaks his hints outside of HOS, and he has a few snarky remarks as well. First, though, you have to find his parts and assemble him. The hint only points to objects in HOS scenes, but you have a map to tell you where you are, and where the HOS are. The strange colors make some scenes more difficult. Animals and plants look cartoony, but machines and other man-made objects look realistic. This game makes me think of sci-fi author Ray Bradbury, who died a few days ago. I started reading his books when I was in the 8th grade- 1961. Rated 4 out of 5 by Clozar from Not So Bad at All I am not going to give details of the story as you can read that in the description of the game as you down load the demo. Definitely download the demo to try this game. It is one of those you will definitely like or hate. And the hour demo will let you know that for sure. There is a Robot companion who gives you hints during HOG scenes and bits of clues as you walk around and click on things. In this game you will be walking back and forth alot. Sparkles for HOG scenes. Otherwise you must look carefully in each scene for objects that are sort of hidden or lying around to be picked up and will be useful during the game. This game could be quite challenging especially if you miss an item. 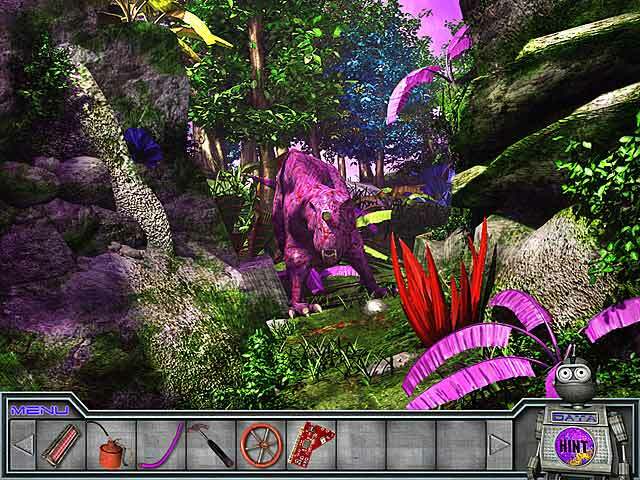 The graphics are okay and quite colourful. HOG's are not too challenging but good. Not interactive. Just finding what you need to help you continue in the game. I think this game is worth a game credit. Rated 4 out of 5 by grandmagin from Fun Game Enjoyed game overall. Only thing I didn't care for was having to go constantly back and forth. Rated 4 out of 5 by Linda_S_55 from Will save for a punch card filler This is a pretty good game. The voice of the robot is a little irritating and can't be turned off without turning off all the sounds. The first scene finding things to build the robot is a bit irritating as well because every time you find something, the robot window pops up to tell you what you have found. But so far it seems to do that only in the first scene to build the robot. It's not so exciting that I played the whole hour. But played about 40 minutes. I'll save this game for when I need to fill a space on a punch card at the end of the month. 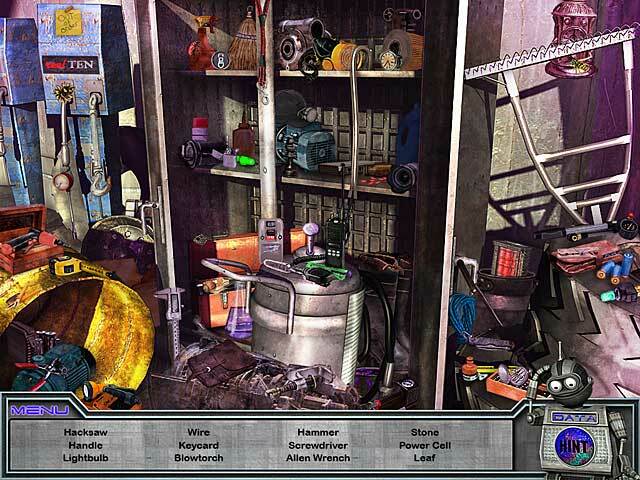 Rated 4 out of 5 by cbellcrm from Sci-fi HOPA Standard adventure game: navigate around picking up stuff and using stuff, punctuated with hidden object scenes and mini-games. Help outside of hidden object scenes has voice acting of robot. It is SO much fun to FINALLY have a sci-fi game. I was so tired of ghosts, witches, vampires, insane asylums, and fairy tales. Game quality is average but PLEASE BUY IT so developers will make more sci-fi. The game reminds me of the old TV series Lost In Space. Great change of pace for folks who like HOPAs. Rated 4 out of 5 by hulahula from HOGs In Space: Finally! Yes, follow Data, the Robot, and go where no HOG has gone before....and about time, too! Nice bright graphics and good potential on the music/sound (that's a definite maybe, I haven't finished the game). However, the game had a rough start for me since I couldn't locate a vital item needed to re-build Data after his ship had crashed. Turns out the missing left arm was attached to the left hand, amazing! The problem is that you have to activate Data before he can give you hints. Anyway, good fun; maybe some traditional HOG ghosts, vampires and missing relatives will also show up in HOG-Space some day. I recommend the demo,,,and beyond! Rated 4 out of 5 by elijah5 from Not A Bad game After All This is a totally different game from the norm. Graphics are excellent. There is a map, but can't use to jump to locations. Story line is okay. Tutorial could have been better. Not always sure what you need to do. It is a pretty fun game. Does make you think. This will not be for everyone, but at least try it before you make a decision. Not easy, but not extremely hard. For those who like a challenge, this is a good one. Rated 3 out of 5 by pattygerad from Hiden object/adventure with a sci-fi twist This was a little breath of fresh air from dark, dismal and spooky HOGS. Storyline was a bit on the simple side. Generally following the crashed unexpectedly near research base on an alien planet. Now you have to find a way to get off. Finding objects was a little painful as they tended to be well hidden in map scenes but I managed to get most without resorting to the Task list. Having hints inside task list came in useful when really stuck on finding an item. HO scenes were nothing special, typical mish-mash of hopelessly unrelated items. Some items were partially hidden behind other items which led to some eye crossing pixel searching and patience to get them. Had to use the hint button 3 times to get all HO scenes out. Interactive items in inventory were straightforward and easy to use. Puzzles were on the easy side but that's good if your just spending a bit of relaxing time out. Was extremely frustrated with the amount of backpedalling required to get from 1 map scene to another especially towards the end of the game. Nothing worse than having to go through a dozen map scenes to locate an item or complete a HO scene just to turn around and go back to where you started and repeat the whole performance again. Curser pointing to get from 1 scene to another was a bit inconsistent. For instance to reverse course sometimes you needed to place curser near lower centre of screen, next scene near middle lower right. This led to a few unwanted moves in the wrong direction. Overall, I'm glad I got this game with a free coupon and didn't pay full price. I'd recommend it for a bit of light entertainment to kill a couple hours but would try to get it on a discount if you decided to purchase. Rated 3 out of 5 by gamer25426 from great game, but lots of flaws i was intrigued by the reviews on this game so downloaded the demo. once the time ran out, i really wanted to carry on playing, just out of curiosity really, so i bought it and i have to say, i really did enjoy it! i have never played a game with this type of story line before so it was very interesting. the only ENORMOUS downside is that its only about 2 hours play, which is not worth the money. also, there are no answers! i wanted to know why the dinosaurs were odd colours and exactly what had happened ect. to be honest, when i fixed the frigate and we took off, i thought we were off to another level-a different planet maybe? the arrow to move to different areas kept messing about and after i accidentally stumbled across the boat, i made a point of moving to the edges of every scene to see if there was another direction hidden somewhere. 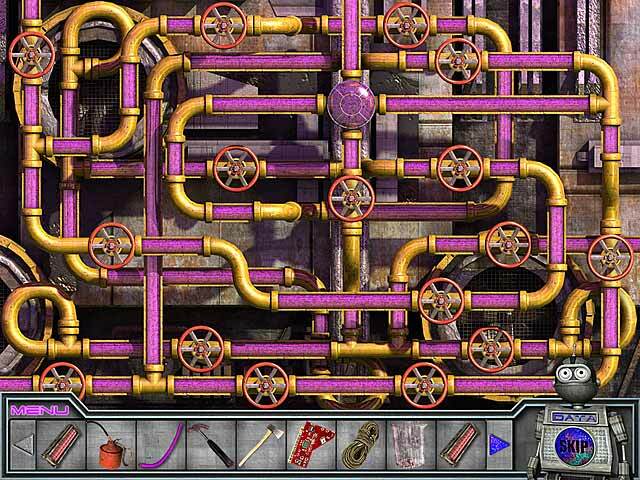 this game has few puzzles which was a real shame. lots of hidden object which i found quite hard at first as some objects are almost completely hidden from view but i got used to it after a while. the hint was pretty unhelpful and it was difficult to 'just find' random objects hidden in the overgrowth etc. it would be worth the money if it lasted 3 times as long as it did. i would say that this game is perfect for beginners as its quite short and easy, however i think the hidden object scenes are too hard for beginners. Rated 3 out of 5 by Lazeedragon from I gave it a try and still was confused. i read the reviews and thought to give this a shot...after 25 min had to quit. this for me is a no buy even at 2.99 graphics average hint system not very good. the tutorial not very good either i don't need my hand held but a walkthrough would be nice basically it is hit and miss with this game and it was a miss with me. do not let this deter you from giving it a try. this game is a bit confusing as well. Rated 3 out of 5 by Tia7550 from challenging game this was a very fun and challenging game, i really enjoyed the challenge, the only thing is if it werent for the people in the forum i would have never gotten through it. it really needs a walkthrough or better guide. Rated 3 out of 5 by Arbee973 from Nice change! Sci-Fi- Hog with some point click adventure A very challenging game. I'm more a HOG fan than point and click, and I am used to that walkthrough, but with patience and forum help I did finish it. A good, solid game. Graphics are a bit dated, music ehh. Still, I liked the story line. Rated 3 out of 5 by sealilly from cargo flight cute game. really different from usual hos a lot of traveling around, but fun who you will meet on the way. nice to play something not the usual. Rated 3 out of 5 by Flossi24 from Definitely Different This was a change from the usual kind of games I play, but it did not grab me. OK you had a map and list of tasks you had to do. There was too much going back and forth, the hint button wasn't much good either. To me it was a an ok kinda game nothing sparkling. I gave the game a try after reading the reviews which is what I like to do. So after playing the demo this is a game I don't think I will be buying. I would say to other gamer's try before you buy that way you won't be disappointed. Its one of those you will either like it or you won't but hey give it a try you might be one of those that do.